We’re excited to share some big changes coming to Oregon Wild. Soon, our emails, advocacy actions, event sign ups, donation pages, and more are going to look different, but we want to assure you: It’s still us! We’re still here, working to protect the things that make Oregon special, and hopefully making it a little easier for you to do the same. June Wildlife Update: Sea Otter Sighting, Crater Lake Wolf Rendezvous, and More! There’s still time to sign up for the Crater Lake Wolf Rendezvous! The 4-day, 3-night trip, September 13-16, will take you to the incomparable landscapes around Oregon's only national park. We'll visit portions of Oregon Wild's 500,000-acre Crater Lake Wilderness proposal including the headwaters of one of Oregon's most iconic rivers: the Wild Rogue. The tentative schedule includes meetings with wolf biologists, naturalists, and local wildlife advocates, possibly a tracking or outdoor skills workshop, scenic drives, and short hikes throughout the area. Get your spot before it’s too late. Traveling east from Prineville on Highway 26 used to be a beautiful drive known for its towering old growth ponderosa pines. This scenic drive meanders through a portion of the Ochoco National Forest along Marks Creek on your way to eastern Oregon. The grassy meadows dotted with old-growth pines created the backdrop to one of central Oregon’s best forest drives. 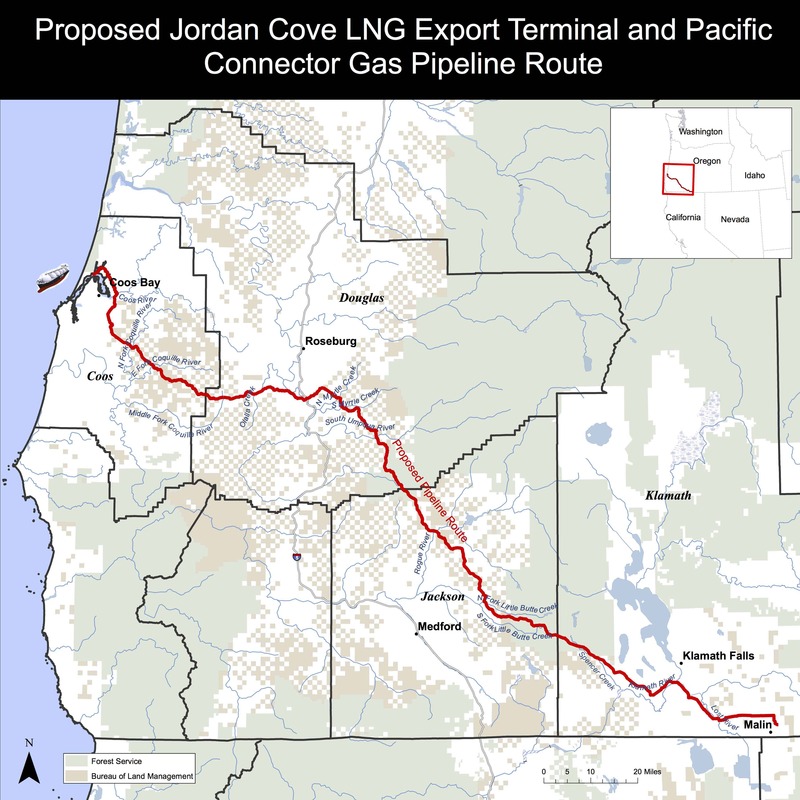 The Jordan Cove Energy Project is a proposal to build a 230-mile fracked gas pipeline across Southwestern Oregon and a Liquefied Natural Gas (LNG) export terminal in Coos Bay (map). The project, which was originally proposed over 13 years ago, has already been denied on the federal level, but was recently resurrected with the hopes that the Trump administration will greenlight the project. Oregon’s old growth is usually threatened by a predictable cast of characters: timber companies like Lone Rock, organizations like the Association of O&C Counties, and politicians like Rep.'s Greg Walden and Kurt Schrader. You’d probably be surprised by another name on that list: The Oregon Department of Transportation. If you’re one of the roughly 67% of Americans that gets at least some of their news through Facebook, you’ve probably noticed some changes in your newsfeed. Like the tributaries for Oregon's many great rivers, the paths connecting brewers and conservationists to a mutual mission of watershed advocacy began at different places but ultimately joined together to become a great force. Over the years, the pairing of environmentalism and craft beer has become more commonplace, but this non-traditional partnership has its roots here in the Pacific Northwest. Meet Heather, our new Marketing and Graphic Intern! Hi there! My name is Heather Lewis and I am the new Marketing and Graphic Design Intern at Oregon Wild’s Portland office. I am going to be a Senior at the University of Portland this fall, where I’ll be studying abroad in Rome and graduating with a B.A. in Communications.